Let's see... The world in which DHS Comix is based is called "LaRaGa", and it is connected to another world, called the mirror world or "GaRaLa" (of course people in the GaRaLa would call LaRaGa the mirror world...). The mirror world is very similar to LaRaGa, and when a creature dies in LaRaGa their soul is reborn in the mirror world, and vice versa (unless they are somehow magically bound to their world, like the magic clans). In LaRaGa there is only one planet, one moon and one sun, and the stars are not far-away suns in this world. In this world, the stars are the the homes of the gods. In the beginning, there were only the two goddesses Luna and Sola - the moon and the sun. They did nothing but fight constantly. Then there came the earth goddess Gaea. While Luna lived in the moon and Sola the sun, Gaea lived in the earth, and she created the Feathries and the Scalers in the images of her sisters, in the hopes of diverting their attention from fighting each other. These people lived on the surface of her home, and she lived between her two sisters, so the Feathries saw only daylight and the Scalers saw only moonlight. The Feathries and Scalers barely saw each other, but lived alone on Gaea for about 1,000 years. This part of the creation story was told in a short Random Encounter volume. 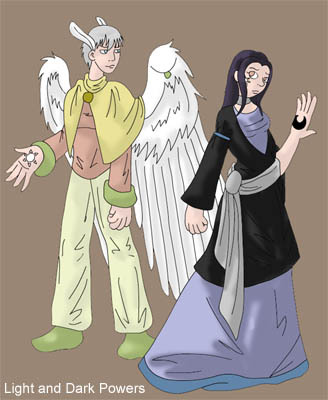 By that time, Luna and Sola grew bored of Gaea's creations and went back to fighting one another. Gaea decided to ignore the two of them and do what she wanted, and so created all the other peoples, monsters, animals and plants. She created so much that she could not watch over them all, and so created the lower Gods and Goddesses. She gave these gods homes in the sky with herself and her sisters, and they became the stars. The higher in the godly hierarchy a god is, the less likely they are to spend time on Gaea mingling with the people. The triad of goddesses (Luna/Sola/Gaea) do not mingle at all, whereas the Trickster God does not spend any time in the sky at all. During the first 2,000 years of the new gods and peoples, the gods were much more active in the world than they are now, and many stories rise from this era. Dhark's Hero School - the first of its kind - was founded, and the age of heroes began. At the end of this time was Gaea's last act of creation, the "Splitting of the World". The Splitting of the World is a long and convoluted enough story on its own (it's being covered in its own comic, slowly), so I'll try to gloss over the details. Basically, Nature Powers and Chaos Powers - the servants of Gaea - heard that she intended to split the world into two seperate worlds, and fought for control of that splitting. Random people tried to stop them from screwing everything up (because everybody knows servants of the gods are apt to act like jackasses), and the end result was LaRaGa and GaRaLa as they stand in Random Encounter and New Game. That is, two worlds with different people, monsters, animals, places, etc., but with the same gods ruling over them. The splitting occurred roughly 1,500 years ago in RE, so ~1,550 in NG. Magic in the DHS Continuum can be used to do many tasks, from setting things on fire to storing objects in a pocket dimension for later use to healing and even illusions. There are two ways in which magic is acquired - one is either born with the ability to cast magic in them, or one asks the gods to lend them their power. People generally have to ask the gods for magic, while monsters generally have their own. Animals usually have no magic ability whatsoever. There are of course exceptions, such as the Fey, who are people that create their own magic, and the Griff, who are people who cannot use magic at all. People often learn magic by attending a shrine school at the temple of the god whose power they wish to use. They can also learn by attending hero schools, and very rarely people are contacted directly by various lower gods and offered magic. People usually have an affinity for one or two gods' magic, but with study they can learn more. The most popular magic is of course that of the nine magic gods (Jake nonwithstanding), though many of the lower gods have some magic too, and the triad of creation goddesses have the most powerful magic. However, in order to use the creation goddess' magic, one has to utterly devote one's life to them. These people become Light or Dark Powers to gain Sola or Luna's magic, and spend all their time trying to spread the influence of their chosen goddess by fighting the opposing powers. There are also Chaos and Nature Powers for Gaea, but they are chosen by existing Chaos and Nature Powers, and are huge dorks anyway. By far the most well-represented profession in DHS Comix, heroes are actually on the decline in LaRaGa. Mostly because as the world grows more civilised, there's less need for roving bands of people to run around slaying monsters and such. They grew as a team of concerned people with magic and combat skill who decided to dedicate their lives to helping those in need, usually through rather violent means. The first school created to teach youngsters how to become heroes was Dhark's Hero School, some decades prior to the splitting of the world. There are also two other hero schools in LaRaGa.